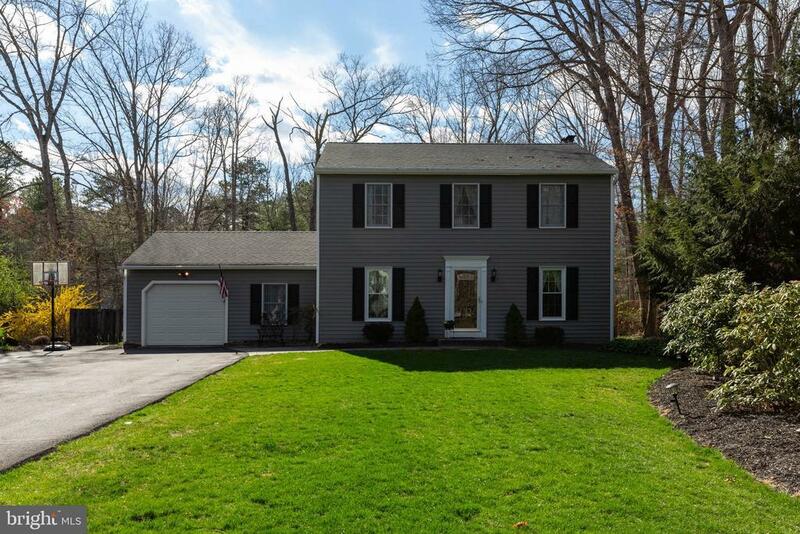 Check out this lovely Colonial in the quiet and family oriented neighborhood of Wallingford Way! As you pull into the newly paved driveway you will notice the stamped concrete patio, pretty flowering trees, bushes and plants that adorn this home which is situated on over half acre of land. Enter through the garage or the front door and admire your beautiful siding that is 2 years young! Inside you will be greeted with hardwood floors, wainscoting up the stairwell, dining room area, several rooms freshly painted and crown molding throughout. A spacious dining room and office/living room area both having a set of double doors allow for that open feel or option of privacy. Continue through to the back of the house where you will find an eat in kitchen with stainless steel appliances and granite counter tops. Many windows along these rooms give ample amounts of natural light making it bright and cheery while cooking and entertaining with family and friends. A fireplace in the family room provides a warm ambiance on those cooler nights. That~s not all, a bonus room off the back of the house is the perfect spot for added entertainment! A half bath and laundry area finish out this main level floor. Upstairs you will find 3 spacious bedrooms all embellished with ceiling fans and newer installed carpet as well as 2 full baths. Head out back to relax on your nice patio and fully enclosed awesome privacy fence or go for a swim in your personal in ground pool with a 2 year old liner! Your own sprinkler system will help you keep the grass looking luscious and green in its prime season. A shed adds extra storage space for those gardening and pool items. Roof is 9 years old. Heater, air conditioner and hot water heater have been replaced within the last 5 years. This home has been well loved and move in ready for its next owner. Located off of Tuckerton Road in Shamong and just minutes from Rt. 206 and Rt. 70. This home has so much to offer and will not last. Contact us today to make it yours!